June 2, 2015 Jay Desko, Ph.D. If you missed our first post in this series, "Building Trust Part 1: Communication", read it here. We all have expectations of ourselves and others and they fall into one or more of the following categories: communication, character, concern, competence, connectedness, and consistency. Trust is built when we prove reliable by meeting expectations in these areas. Character refers to a person’s intrinsic value system and external actions. Areas often associated with character are honesty, fairness, and hard work. Character is the second value we are focusing on to build trust because the way others perceive your character will effect how much they trust you. Below are four ways to help you form good character and earn the trust and respect of those around you. 1. Be honest and take responsibility. Proverbs 12:22 states, “The LORD detests lying lips, but he delights in men who are truthful.” Trust is fostered when a person is perceived to be manifesting honesty in their communication and actions. It is both powerful and refreshing when those in leadership roles stand in front of a person or group and take responsibility for their actions. The simple phrase "I [or we] have made a mistake and take full responsibility for it" is seldom heard. 2. Make sure everyone is in the loop. When people within a team or organization are not spending regular time together in communication, they may discover a decision has been made without their involvement. This may cause certain members to privately or publicly question the character of other members, even though those individuals may not have committed any unethical behavior. 3. Say what you mean. Since perceptions are held as truth, someone’s character may be called into question even though they may not have committed any unethical act. Leaders must monitor the perceptions of others by regularly testing proposed actions before implementing them and by seeking honest feedback from others. 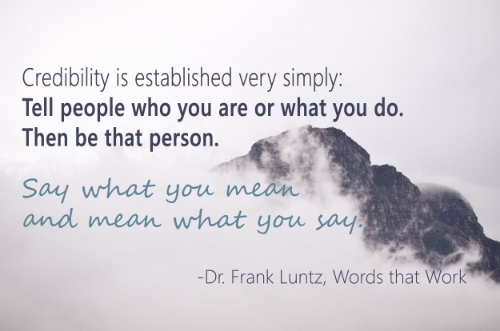 Do you personally manifest honesty and integrity with those around you? How do you know? Does your organization manifest honesty and integrity with your constituents? How do you know? Catch up with Part 1: Communication or read the next post in this series, Part 3: Concern. For more on cultivating trust, read the article "Cultivating Trust in Your Organization" in our book FIT – Improving the Leadership Health of Yourself and Others.